Men! They just don’t get it. 1) A pair of shoes (Duh!). Pick the ugliest looking pair. So even if you mess up it’ll still look prettier than the original. Unless you are that bad at painting. Then I can’t help you. 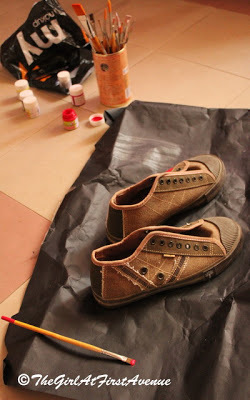 2) Paints in whatever colors you want. I used fabric paints. 1. Think of the colors before hand. Unless you want to paint over it again and again. Umm.. No I din’t do that. 3. Annnd you are done! 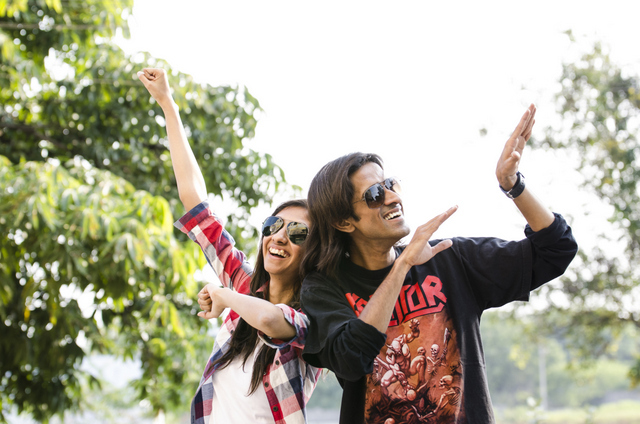 Wear your new shoes and prance around. 4. Add some fun laces. Click a few pics. Congratulate yourself on a job well done! I am definitely going to try it out once because i am NOT that bad at painting!! 😛 Lol! Your blog is like simply WOW!! <3<3 Waiting eagerly for your next post! :) I am following you now. Also, if you have the time then please do check out my blog. Though i do not blog exclusively about Fashion but there will be posts about them in the future! 🙂 I am new blogger in town actually. Just 3 posts old. 🙂 If at all you like what i write then do comment and follow too! That was wonderfully done.. Brilliant job. I am kind of liking the color red now. The pair of shoes in my old shoe rack needs a transformation for sure. This weekend I will try painting them. Very nice! Looks like a brand new pair of sneakers. Excellent job! Oh wow!! thats simply amazing! 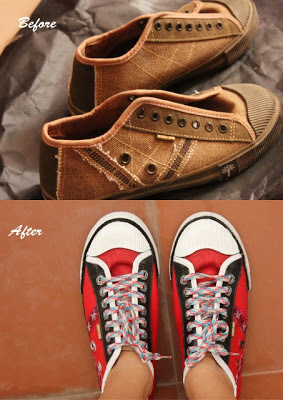 Wow..I never knew that we could give a makeover to shoes! You have done an excellent job, my dear! I could hardly believe both the pairs are the same set of shoes.. Awesome! 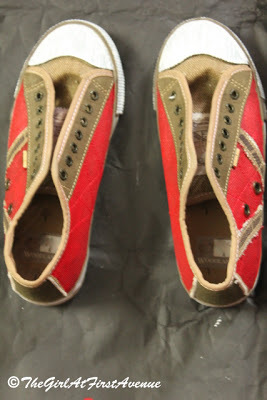 These look incredible, such a fantastic DIY and beautiful done, I want a pair! Now that was amazing! Wow! definitely going to try this! Wow.. They turned out so well gurl!! Congratulations!! I am back..missed reading your posts! WONDERFUL JOB …i am tempted to paint a few things I have too.Gonna get fabric paints asap! nice diy dear! !I like it!! I lov well written blogposts! not a huge fan of sport shoes, but u did a fantastic job in painting these! P.S. im ur newest follower from now on!!!!!! Woaaah, girl you are amazing I must say. Super duper work! I have a red, blue and black converse safe in my shoe rack. Worn, NEVER. Will give them a makeover now and will prance around. THIS IS ONE OF YOUR BEST POSTS EVER!!!!!! They dont even look like they been painted!! Sooo Rafta style and soooooooooooooooooooo funky!! 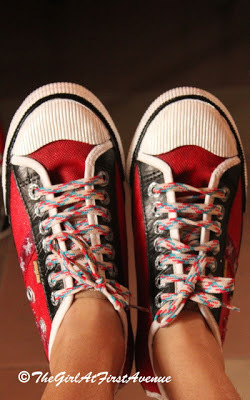 The laces just turn it a bit more cool!! 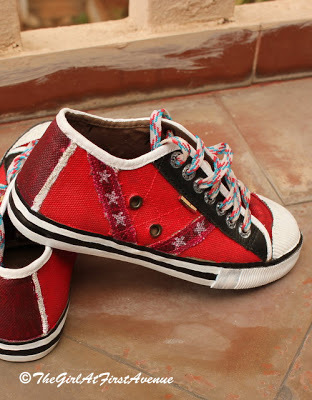 What a fun and interesting way to spice up your sneakers! Not bad…not bad at all! my gawd girl…this looks like a completely new pair-you did the job with such finesse…and they seem to have come alive! in fact it is so neatly done that it does not even look painted! I like! I like! 🙂 Good Job! I'm always envious of those who are creative and talented- you appear to be both!! Good for you.